Tuesday July 30th 1889 Edith is eight years old today. I helped iron some in the morning and Agnes and I cleaned the garrett before noon. I rode to town with Will soon after dinner and come right back and worked at my wrapper till supper time. Wednesday July 31st 1889 I finished my wrapper this morning and cut out a couple of night gowns for myself which I finshed before bed time. We got a bushel of black berries which we put up before supper time. Will was to town in the eve. 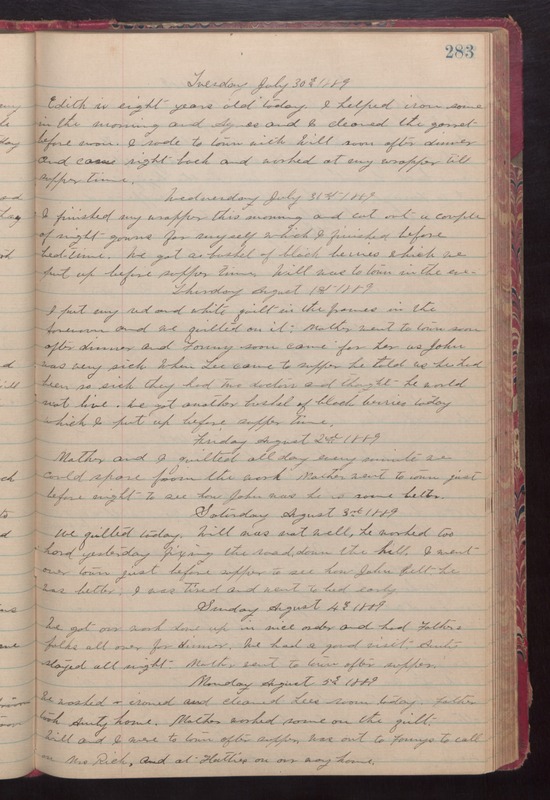 Thursday August 1st 1889 I put my red and white quilt in the frames in the forenoon and we quilted on it. Mother went to town soon after dinner and Fanny soon came for her as John was very sick. When Lee came to supper he told us he had been so sick they had two doctors and thought he would not live. We got another bushel of black berrires today which I put up before supper time. Friday August 2nd 1889 Mother and I quilted all day every minutes we could spare from the work. Mother went to town just before night to see how John was he is some better. Saturday August 3rd 1889 We quilted today. Will was not well, he worked too hard yesterday fixing the road down the hill. I went over town just before supper to see how John felt. He was better. I was tired and went to bed early. Sunday August 4th 1889 We got our work done up in nice order and had Fathers folks all over for dinner. We had a good visit. Aunty stayed all night. Mother went to town after supper. Monday August 5th 1889 We washed & ironed and cleaned Lee's room today. Father took Aunty home. Mother worked some on the quilt. Will and I were to town after supper was out to Fannys to call on Mrs Rich and at Hatties on our way home.